PORTLAND, Maine — Beneath the cold ocean waters off the coast of Maine, the nation’s lobster breadbasket, lie hundreds of thousands, perhaps millions, of old wire lobster “ghost traps.” Lost over the years to storms, boats — even the knives of fishermen who’ve cut them from their buoys to settle scores — many of the traps continue catching lobsters. 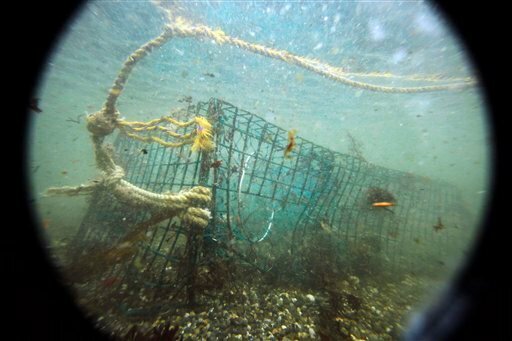 Marine biologists say lost and abandoned lobster, crab and other fish traps plague coastal waters around the globe, putting pressure on a number of already-stressed fish populations. In U.S. waters alone, millions of dollars’ worth of marketable seafood is lost each year. Lobstermen this winter will grapple up gear from selected spots in the first large-scale study of ghost traps along the Maine coast. Nationwide, other studies are focusing on lost traps off the Pacific, Atlantic and Gulf of Mexico coasts. The extent of Maine’s ghost-trap problem isn’t fully known, but lobstermen say they sometimes recover traps that contain skinny lobsters — ones that appear to have not eaten — or shells from lobsters that have starved and withered away to nothing or been eaten by other lobsters. Most lobstermen feel it’ll get worse with a new federal regulation requiring them to use a certain type of rope on their gear. The rope, they say, is prone to breaking and will result in even more lost traps. 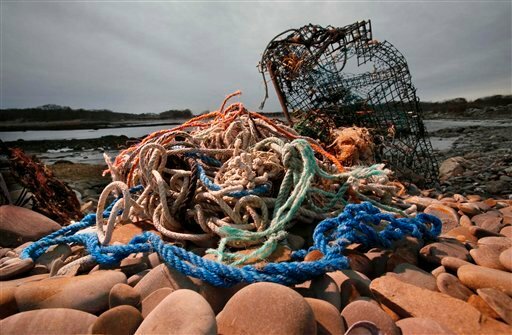 Fishermen have been losing and discarding equipment for as long as they’ve plied the world’s seas. But the range and impact of that refuse has grown in the past 50 years as fishing has increased, especially with more durable, non-biodegradable equipment. The ability of lost lobster traps to continue fishing diminishes as the bait — herring or some other oily fish — dissipates. Still, scientists believe the traps continue catching lobsters, attracting creatures in search of shelter. And while the traps are required to have escape vents that break free over time, not all vents break free as intended. “Ghost fishing” studies are under way or recently completed along all U.S. coasts. They include looks at Dungeness crab traps in Alaska, Washington, Oregon and California; blue crab and sea bass traps off North Carolina; blue crab traps in the Chesapeake Bay and the Gulf of Mexico; spiny lobster traps in Florida; and fish traps in the U.S. Virgin Islands. Other studies have looked at the impact of lost fishing nets found in Puget Sound in Washington and off the Northwestern Hawaiian Islands, where more than 600 tons of nets were collected. In Maine, the Gulf of Maine Lobster Foundation has received a $200,000 grant to look at the issue. The foundation plans to recruit 10 lobstermen in each of seven Maine harbors to grapple for lost traps late this winter or early spring, said Laura Ludwig, who is heading the project. The findings will be recorded and assessed in hopes of determining how effective the traps are at fishing after they’ve been lost in the deep. Depending on their condition, the recovered traps will be returned to their rightful owners, recycled or disposed of. In Maine, where lobstermen actively fish more than 2 million traps, it’s estimated that 5 to 10 percent — 100,000 to 200,000 — are lost in any given year. In a decade, that could be 1 or 2 million lost traps; if that’s the case, there could be as many abandoned and lost traps off the Maine coast as ones currently in use. Ben Crocker Jr., a lobsterman from Roque Bluffs in eastern Maine, says most lobstermen feel the lost traps aren’t actively catching lobsters because they’re so mangled and don’t have bait in them. “It’s mostly just garbage on the bottom,” he said. Two winters ago, Ian Lussier of Owls Head grappled for lost traps with another lobsterman in Penobscot Bay and recovered several hundred traps in depths of 100 to 400 feet, he said. Some had tags showing they were owned by lobstermen who hadn’t fished in more than a decade. Some traps were wooden, which haven’t been used for the most part for 25 years. How much lobster the traps are catching is almost a “non-issue” for Lussier because he believes so few are caught. The bigger issue, he says, is a new federal regulation that aims to protect endangered North Atlantic right whales by outlawing use of floating rope that connects lobster traps on the ocean bottom and sometimes entangles the whales. Lobstermen say the sinking rope sits on the rocky bottom, where it easily abrades and breaks free, resulting in more lost gear. Lussier said he lost 87 traps out of his 800 between April 5, when the rope law went into effect, and the middle of June, because the rope deteriorated on the rocky bottom. “What’s going to happen is more traps are going to build up on the bottom in areas where we have to use sinking line,” Lussier said. Worldwide, concerns about lost gear are growing. Besides continuing to catch fish and shellfish, lost nets and traps have been known to snag whales, seabirds, turtles and other animals, the Food and Agriculture Organization of the United Nations reported this year. They can also hurt the benthic, or ocean-bottom, environment and create navigational hazards. Frank Chopin, a senior fisheries officer with FAO in Rome, said more people are taking part in programs and campaigns to recover the gear. But there hasn’t been a systematic approach to removing it.